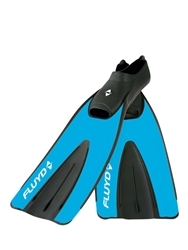 Italian made, these fins are a great buy for your club or to start your UWH journey. The fins come in all sizes. These fins aren't as stiff as more expensive options available, but the high-quality Italian rubber and plastic is a durable option. Ideal for fast cadences and beginning to intermediate players. Due to the open toe, if you aren't wearing booties it is recommended to order a size below your shoe size unless you wear booties. There is a small international fee for handling these fins at checkout due to their shipping size.